The anticipation has been building since before Christmas…a new organic and natural foods store was coming to an area near our house…Yipee! Everyday I would check Facebook to see what Earth Fare had to share, mainly waiting for the announcement of the grand opening. Finally, the day was finally here. 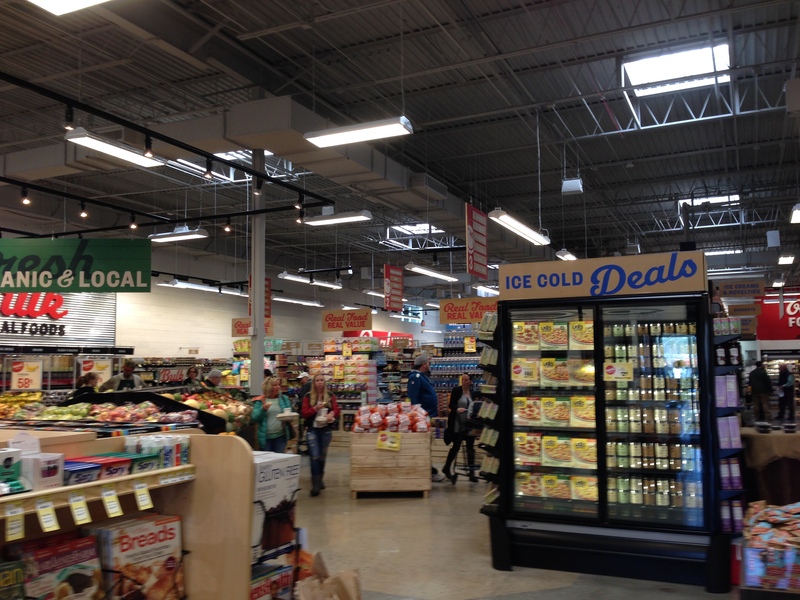 Earth Fare at Peachtree Pkwy in Norcross, GA has finally opened! (By the way, the address says Peachtree Corners, GA, but it’s really Norcross, GA). Anyway, my husband and I went there yesterday to check it out. The store is big, replacing the recently closed OfficeMax, located on a fairly large plaza. Upon entering we were greeted and given a shopping bag, which I thought was a nice touch. 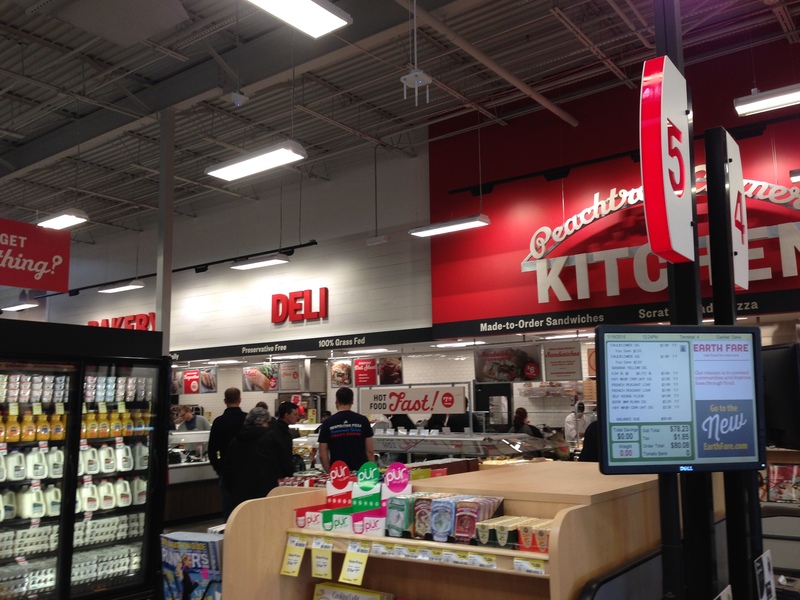 As you walk in, you stumbled upon cash registers right in front of you. It was confusing which way you should go, so my husband went right, while I turned left and we ended up walking in different directions, after which I had to call him over and he joined me in the produce section. Not the most convenient of store layouts. The merchandise was all nicely laid out, neat and clean. The non-organic items had some REALLY great prices, like the .99 Pineapples and the Blueberries 2/$5. There are several variety of apples, mostly organic, most at $1.99/lb, which is a great price. I found most of the organic veggies that I was looking for, except for Basil and Chives. Not sure if I just didn’t see them, or they don’t carry those items. Then, right after the produce section, is the bulk items sections. Everything from flour to sunflower seeds, nice selection. We walked through, bumping into mostly every person there (the store was not that full on a Friday afternoon) as we made our way to the dairy section. Wait, where is the dairy section??? The middle of the store is taken up by regular aisles, filled with your ordinary items like chips, cookies, and canned items, but where is the dairy section? Ah, well, you’d need a superman cape and x-ray vision to find it. The dairy “section”, I put that in quotes because it’s not really a section, it’s a small refrigerated aisle in the middle of the store. All the dairy – milk, butter, eggs, are behind glass doors that you constantly have to open and close when reaching for various items. The selection is pretty good, all my favorite brands (Organic Valley, Horizon Organic, etc.). I just wasn’t too fond of the glass doors and the difficulty of having to reach for items when you already have a few items in your arms. Let’s just say it’s more like trying to do a yoga pose. Anyway, we finally circled around to the baked goods section. It was great to see a variety of breads that they bake onsite. What I really LOVED seeing is how the price tags list all of the ingredients for that particular product. Next to the breads is a tiny fridge with single-slice cakes and cupcakes, again, the ingredients are listed on the price tag, very cool!!! Not sure about you, but I like to know what goes into my food. Next was the meat/seafood section – small, but seems like a good variety, I especially like the grass-fed meat and wild-caught seafood display. Every department had the staff out and about, offering samples and telling you about all the different items they had. You can tell these people are passionate about what they do. The friendly service was top notch even at checkout! All in all, a great store, a bit crowded as far as the aisles and walkways, but a nice selection of foods. I just wish they had more organic items, but I would definitely shop there, because their prices are great, especially on fruits and vegetables.